Unique Gift Items For Anyone! FacePlants make a perfect unique gift item for anyone. 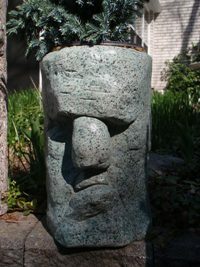 High quality and handmade in Paris Ontario by Canadian artisan Steve Goodale, faceplants are sure to bring a smile to any face. Some common ideas for using FacePlants are (of course) for plants, small flowers and herbs do especially well like on a kitchen window ledge. You can also use a FacePlant on an office desk for holding pens & pencils. With both indoor (closed bottom) and outdoor (open bottom) models available and a huge selection of colour and styles give something unique like a FacePlant! When ordering in sets the cost per FacePlant is deeply discounted so you can give funny, cute and heart warming presents that will last for years for only a few dollars each. This is a great option to help you maximize your gift shopping budget! If you are interested in a custom request, colour or style of statue you can contact us or call 1-888-818-7665. Prices and availability for custom projects may fluctuate seasonally.